The Afghanistan War Diary, released by Wikileaks, has exposed as never before a culture of lies, deceit, violence and manipulation of information in the current United States-led war in that country. The volume, more than 90,000 secret records of actions taken by the American military from January 2004 to December 2009, and the depth of the culture they depict, are staggering. Their significance is immense. Their release is of interest to me not least because in my book, Overcoming the Bush Legacy in Iraq and Afghanistan, published in March 2010, I have systematically identified and analyzed the Bush administration’s naïve calculations, strategic and operational blunders, disregard for history and other cultures, even downright prejudices that have brought so much harm to so many. The Afghan War Diary makes a major contribution to that debate. In historical terms, the significance of these documents is comparable to that of the Mitrokhin files uncovered nearly two decades ago. The defection of the KGB archivist Vasili Mitrokhin, with detailed notes of thousands of top secret files to Britain after the Soviet state collapsed, has long been celebrated in the West as an intelligence coup. But Mitrokhin defected after the Soviet Union had disintegrated. The Afghan Diary has been published when the West is still fighting the war in Afghanistan. Although it was already looking unlikely that the U.S.-led occupation forces would secure their adversary’s surrender in Afghanistan’s mountains, the publication of these documents makes it probable that the impact on public opinion will be a turning-point in the current war. The Mitrokhin archive was an account of Soviet military-intelligence activities and culture of lies, deception and violence in great detail. The trail went deep inside Afghanistan in the decisive phase of the Cold War in the 1980s. 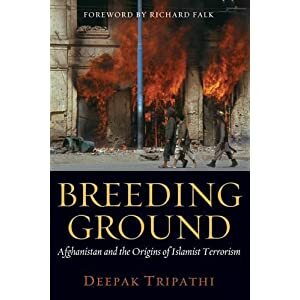 In another book Breeding Ground: Afghanistan and the Origins of Islamist Terrorism, I have discussed the KGB’s infiltration into Afghan society in the 1960s and 1970s, as well as the Soviet security service’s role before and after the December 1979 Soviet invasion of Afghanistan, based on Mitrokhin’s account. With the United States left as the only, but increasingly tired, superpower now, the Afghan Diary does something similar. It tells the story of the American military and the Central Intelligence Agency, their activities and culture during the Afghan war in the early twenty-first century. The Obama White House was quick to denounce the release of the war logs by Wikileaks and shared with the New York Times, Guardian and Der Spiegel. The administration called it “irresponsible” and an act that placed “troops in danger.” The founder of Wikileaks, Julian Assange, responded by saying the files showed that “thousands of war crimes” might have been committed in Afghanistan. And he promised to reveal more. Official reaction in Washington and friendly capitals has been all over the place. President Obama’s spokesman, Robert Gibbs, dismissed the leak as making no new revelations. But Washington’s furious reaction against Pakistan’s spy agency Inter-Services Intelligence Directorate for keeping close ties with the Afghan Taliban made it look as though the Obama administration had learned of the relationship for the first time. When asked what had changed after the disclosures, the British foreign secretary William Hague’s response was “nothing.” Even some seasoned journalists like the BBC’s Frank Gardner said there were “few great surprises” to those following the “twists and turns of the Afghan conflict.” Some events had previously been reported in the press and keen followers of news might have suspected that other similar occurrences had taken place. What is striking here is the scale of recorded information and the pattern it points to. The Pentagon launched an immediate inquiry to find out who leaked the documents. Obviously, they came from someone within the Department of Defense. Again, there are parallels between this and the Mitrokhin affair. The war in Afghanistan has become expensive and unpopular in the United States and elsewhere as it has progressed since the U.S.-led invasion in October 2001. Like Mitrokhin, the leaker inside the Pentagon, almost certainly a loner, must have had ready access to a huge mass of documents, probably an insider occupying a key position. The individual must have been so disillusioned with American policy as to be willing to take great personal risk in collecting and forwarding the files in electronic format to Wikileaks. Almost twenty years before, Mitrokhin had made notes of KGB files on paper, smuggled the files to Latvia after the Soviet Union had been dissolved and, having failed to persuade the U.S. embassy in Riga about his authenticity, took refuge in the British embassy in the Latvian capital. The timing and the manner of Mitrokhin’s escape thus minimized danger to himself. What does the Afghanistan War Diary tell us? To what extent was the information therein already known? And what is its significance now? I have said at the outset that the leaks uncover a culture of lies, deception, wanton violence and media manipulation through manufactured or wrong information. The existence of a hitherto undisclosed death squad named “Task Force 373” would go some way toward explaining that culture. TF 373, a special forces “black” unit created to hunt down targets for assassination or detention without trial, has a list of two thousand senior Taliban and al Qaeda figures. The documents reveal that, in many cases, the black squad simply killed suspected “militants” without attempting to capture them. Its members also killed civilian men, women and children, even Afghan police officers who came in their way. A deeply frightening pattern of extrajudicial killings of innocent civilians emerges. In May 2008, the United Nations special rapporteur Philip Alston went to Afghanistan to investigate reports of gratuitous violence against innocent civilians and “suspected militants” against whom nothing had been proven. Alston warned that foreign forces in Afghanistan were neither transparent nor accountable. Afghans who attempted to find out who killed their loved ones “often came away empty handed, frustrated and bitter.” Fifty-two civilian deaths were recently reported with graphic pictures on international television of the scene of destruction and villagers digging graves for their loved ones. Local residents of Rigi village in Sangin district gave accounts of how missiles were fired from air, resulting in the carnage. The Afghan president Hamid Karzai bitterly complained. A terse NATO statement said “there was no evidence of casualties beyond insurgents” and that a joint NATO-Afghan government investigation was going on. Now, for the first time, the leaked war logs reveal details of deadly missions by TF 373 and other units hunting down Jpel targets that were previously hidden behind a screen of misinformation. They raise fundamental questions about the legality of the killings and of the long-term imprisonment without trial, and also pragmatically about the impact of a tactic which is inherently likely to kill, injure and alienate the innocent bystanders whose support the coalition craves. The War Diary goes on to record several instances of the insurgents firing on American aircraft that were suppressed from the public records. In May 2007, a Chinook helicopter was hit by a missile in Helmand, killing everyone on board. The United States claimed that the helicopter was struck by “lucky shot from a rocket propelled grenade” with no heat-seeking device. A month before that incident, a British Chinook helicopter crew had reported that a missile passed the aircraft before exploding just fifty feet from it. And in July 2007, the crew of a C-130 transport plane reported that a rocket flew past as they refueled at 11,000 feet. Despite official denials, there is evidence that the risk is taken seriously. Military aircraft leaving flares to distract enemy missiles are regularly seen in the sky. It is worth recalling President Reagan’s decision to supply heat-seeking Stinger missiles to anti-Soviet fighters in Afghanistan in 1986. It turned the tide against the Soviet occupation forces. Britain supplied less sophisticated, but still lethal, Blowpipe missiles to the Afghan resistance. The decision by President Reagan and his CIA director William Casey, both avowed anti-Communists, to supply the hi-tech Stinger missiles is discussed at length in my book Breeding Ground. There had been a fierce debate in the CIA and the Defense Department for many months before their delivery to the anti-Soviet Afghan forces via Pakistan. Some in the Reagan administration strongly opposed the move, arguing that the weapon was too advanced to pass on to unreliable forces. But I explain in Breeding Ground that Reagan and Casey were determined to make any sacrifice and pay any price to ensure that the Soviet Union was defeated. They appeared to have no regard for future consequences. As I write this article, reports are coming in of another German reconnaissance plane being lost in Kunduz province, a Taliban stronghold in the north where insurgent activity has been spreading. It will be the fourth German aircraft to have been lost in Afghanistan this year. In my book Breeding Ground I make the point that the Stinger anti-aircraft missile had highly advanced heat-seeking missile technology in the 1980s. Its deployment in Afghanistan via Pakistan’s spy agency ISI came with the obvious risk that the technology could one day be used against the United States and allies. Now the Afghanistan War Diary raises the haunting question, “Have the Taliban, and by implication Pakistani intelligence, got that technology”? If so, the consequences for the West and for Pakistan’s traditional adversary India are ominous. That there continues to be a close relationship between Pakistan’s ISI and the Afghan Taliban is neither new, nor surprising. Afghanistan is a frail neighboring state bordering on Pakistan. Pakistan’s interest in Afghanistan is a historical fact of the region’s politics. What is surprising, though, is that the Bush administration was naive enough to forge an anti-Taliban alliance with Pakistan’s military ruler General Pervez Musharraf within hours of the 9/11 attacks. And President Obama continues to hope that the present military-civilian ruling establishment will deliver despite South Asia’s geopolitics pointing in the opposite direction. Has anyone noticed that wherever the CIA or/and Pentagon got involved in a foreign country's affairs the death squads pop up, like mushrooms after rain?